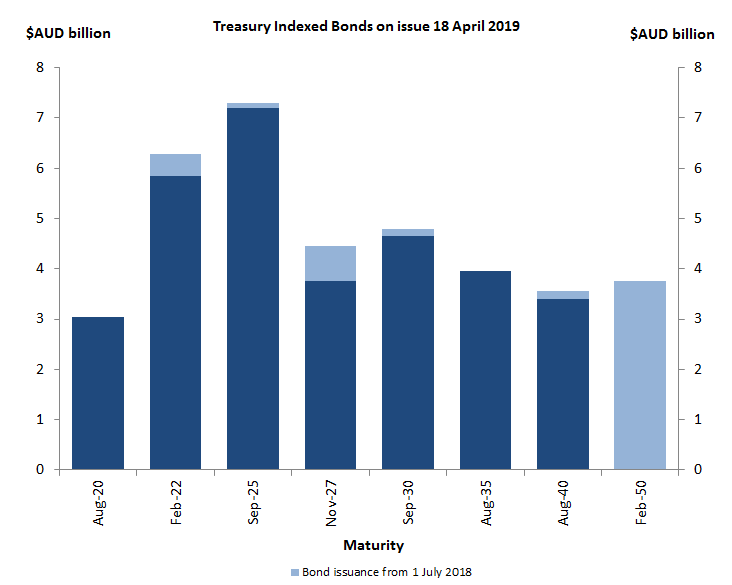 Treasury Indexed Bonds are medium to long-term securities for which the capital value of the security is adjusted for movements in the Consumer Price Index (CPI). Interest is paid quarterly, at a fixed rate, on the adjusted capital value. At maturity, investors receive the adjusted capital value of the security – the value adjusted for movement in the CPI over the life of the bond. All Treasury Indexed Bonds are exempt from non-resident interest withholding tax (IWT). * If the coupon interest payment date is not a business day, payment will be made on the next succeeding business day without payment of additional interest. Note: Kt factor is the factor with which the original face value of an indexed bond is adjusted in order to reflect the cumulative capital accretion owing to changes in the CPI. There is an active secondary market for Treasury Indexed Bonds. The Australian Financial Markets Association (AFMA) has published conventions that apply to trading in the over-the-counter market of long-dated debt securities such as Treasury Indexed Bonds. Active Treasury Indexed Bond market makers are listed in How to Buy AGS. The AOFM holds regular tenders for issuance of Treasury Indexed Bonds. For details of coming transactions, see Forthcoming Transactions or subscribe to the AOFM email service. The Information Memorandum for Treasury Indexed Bonds [PDF 111KB | RTF 1.32MB] provides detailed information concerning these securities including the terms and conditions of their issue. Treasury Indexed Bonds are both quoted and traded on a real yield to maturity basis rather than on a price basis. This means the price is calculated after agreeing on the real yield to maturity. The price is calculated by inputting the real yield to maturity into the appropriate pricing formulae. i = the annual real yield (per cent) to maturity divided by 400.
f = the number of days from the date of settlement to the next interest payment date. d = the number of days in the quarter ending on the next interest payment date. g = the fixed quarterly interest rate payable (equal to the annual fixed rate divided by 4). n = the number of full quarters between the next interest payment date and the date of maturity. Index over the two quarters ending the June quarter preceding). for the quarter immediately prior to the relevant two quarter period. Kt = nominal value of the principal at the next interest payment date. Kt-1 = nominal value of the principal at the previous interest payment date. Kt-1 is equal to $100 (the face value of the stock) at the date one quarter before the date on which the stock pays its first coupon. As an example of the working of the formula consider the 0.75% 21 November 2027 Treasury Indexed Bond for a trade settling on 27 October 2017. Assuming a real yield to maturity of 0.93 per cent per annum the price per $100 face value is calculated to be $98.638. In this example, i = 0.002325 (i.e. 0.93 divided by 400), f = 25, d = 92, g = 0.1875 (i.e. 0.75 divided by 4) and n = 40. The K value of this bond (Kt-1) on 21 August 2017 (the previous interest payment date) was 100.00 and the K value (Kt) for 21 November 2017 (the next interest payment date) is 100.32. The 0.32 per cent increase in the K value reflects the average increase in the Consumer Price Index over the two quarters to the June quarter 2017. If the trade was for Treasury Indexed Bonds with a face value of $20,000,000 the settlement amount would be $19,727,600.00. Note that the Kt in formula (2) is still the indexation factor on the next interest payment date, even though there is no interest payable to the subscriber or purchaser on that date. That is, this Kt continues to apply in the ex-interest period.